Valentino means pure luxury. There is no other designer that has spent so much time in pursuit of luxury and elegance. This wonderful Italian brand is also known for the love to red color and beautiful and feminine women fashion. Among known clients of this fashion house there were such style icons as the Jacqueline Kennedy Onassis and numerous movie stars of today as well. What about men's apparel and handbags by this designer? The Valentino man bag collection has plenty of fashionable handbags for men to offer. 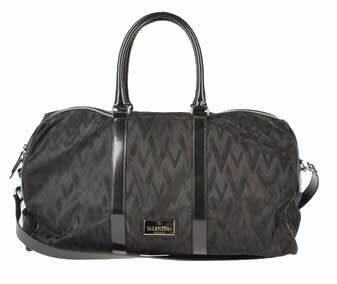 Valentino men's bags are large in size and can be easily used as travel or luggage or carryall bags. 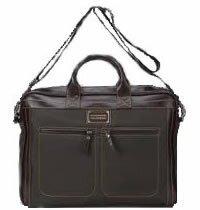 This Italian label loves to use black color for the man handbags, there are spacious men's totes and also black messenger bags that can easily carry a laptop inside. Valentino leather messenger bags for male clients are very comfortable to use, the inside pockets are well organized and the interior leather is durable and practical. Also there are Valentino laptop bags fitting the purpose; these laptop bags/cases can be described as the luxury Italian designs meets with functionality. Also the styles and shapes are almost timeless and these bags are not just the latest fashion flick. All interior is well organized, pockets and compartments so that you don't feel disappointed. Valentino is a master of luxurious elegance and you will find the best of Italian handbag manufacturing traditions in each and every handbag made by this label. If this brand's bags for men seem a bit overpriced, you can always try to look for the sale option to get discounted laptop bag or Valentino travel bag. This brand makes lovely accessories and the quality is as good as the designs. For instance this duffle (featured on the photo to the left) has been made in leather and fabric. It is sized 19.5" (W) x 12.5" (H) x 10.5" (D). Its price tag says $1300 (at yoox.com) and it has a zip closure. Very decent and neutral travel bag.